Known alternatively as New Buffalo, the co-writer of the Feist hit “1234” and Mrs. Darren Seltmann of the Avalanches, Sally Seltmann has taken a step forward in declaring herself… Sally Seltmann. On Heart That’s Pounding, her third album and first under her own name, the Australian singer-songwriter breaks away from the New Buffalo moniker that served her well for her first two records, The Last Beautiful Day and Somewhere, anywhere. With renewed confidence in her ability to pen a pop song, thanks in part to the success of “1234”, Seltmann has made a much brighter, lusher record that conceals some of the darkness that has run through her previous work. We talked to Seltmann the night after a North by Northeast show, and just as she was preparing to head over to Toronto Island for an all-day concert featuring Broken Social Scene and Pavement. Shawn Conner: How does it feel going under your own name instead of New Buffalo? 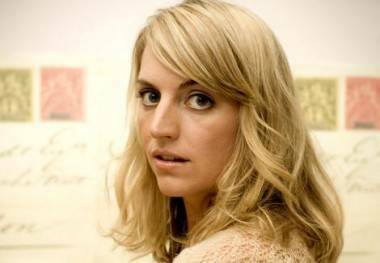 Sally Seltmann: It feels good. It just always felt a bit confusing, just trying to tell people it was a solo project and not a band. SC: I guess it would help going under a name like New Buffalo because people know not to expect just your regular, strummy singer-songwriter. SS: Yeah, that’s one of the reasons why I was New Buffalo. I don’t think I’m ever going to be one of those strummy guitar-y people. SC: How did “1234” help? Is it a calling card now? SS: I think it’s probably made people more aware of me as a songwriter. It’s sort of weird. It’s hard for me to have a full understanding of what it’s meant. It’s definitely been a good thing. SC: Going into this record, did you have a renewed sense of confidence because of it? SS: Yeah, especially when I was younger I wasn’t confident as a person. I had a go at being a singer-songwriter and still always had a lot of doubt. But the success of “1234” has helped give me confidence and make me think lots of people can like songs that I write. SC: Did it allow you to write a different kind of song for the record? SS: It made me think differently about the way I did my music. The version I gave Feist was very slow and stripped back and minimal. I’d been aware of this before, but it’s quite exciting in a way what you can do for a song. You can write a song and it seems like a really slow ballad but the way you produce and record it you can do so much. I found it inspiring what Feist did with “1234”, and it inspired me to think more openly about the song that I would write and how it would be recorded. SC: It’s definitely more lush than the last one, and not as dark. SS: It was hard for me making Somewhere anywhere, it felt like a very lonely, quite dark album. My response to making that album was, I wanted to make an album that was much more uplifting, with more drums and bass and embracing life a bit more. I didn’t want to feel like I was going out and playing shows and singing about how I feel sorry for myself. SC: I notice the title track of “Heart That’s Pounding” quotes Loudon Wainwright. SS: Quite awhile a friend put me on to his song “Motel Blues”. I really love it. It’s basically him wanting a girl to come back to his motel room – the lyrics are “Treat me nice.” But then he says “Come back to my motel room/Save my life”, as though if she doesn’t, he’ll die. I’ve always just really loved that idea. I guess that’s what inspired me to write that song. I notice one of my friends is a friend of his on Myspace and I really want to get in touch with him and say “thank you” and get the album to him to see what he thinks. This entry was posted in interviews and tagged Feist, interviews, music videos, Sally Seltmann. Bookmark the permalink.